Up until recently, many Europeans knew images of large refugee camps and desperate families trying to cross borders only from TV screens. The unprecedented influx of refugees into Europe, the largest since World War II, have made these scenes reality in many European neighborhoods. Feelings of empathy and shock are increasingly joined by worries about the consequences the refugee crisis will have on society, welfare institutions and labor markets. In the EU these worries drive public opinion and political action, causing closings of Schengen borders and the resistance against a fair allocation of refugees among EU member states. Scientific evidence proves that many of these worries are unfounded. Various empirical studies by members of the IZA network of international labor economists point to the economic opportunities of immigration and present ideas of how Europe could achieve a fair and effective allocation of migrants that preserves European principles and European unity. The empirical findings are unambiguous and should be taken into account by European policymakers in their efforts to establish a functioning integration policy. 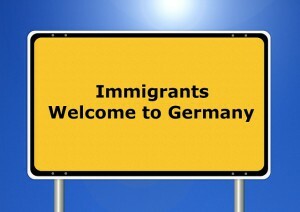 In recent weeks many European tabloids spread the preconception of the job-stealing immigrant. IZA Research Fellows Giovanni Peri and Mette Foged reject that myth in a thorough study on how the massive influx of immigrants to Denmark during the period 1991-2008 impacted the labor market outcomes of low-skilled natives. Contrary to popular belief, the researchers do not find an increase in the probability of unemployment for the unskilled Danish population. Instead, the findings suggest that the immigrants, who in this case were mainly refugees from Former Yugoslavia, Somalia, Afghanistan and Iraq, caused an “occupational upgrading and specialization” of native Danish employees. While immigrants are initially restricted to occupations and jobs consisting of manual tasks due to their language problems, natives leave these jobs by specializing in more complex occupations with a primarily interactive task content. Accordingly, the immigrating refugees had a positive effect on wages and mobility of native low-skilled population. To test such effects on a larger scale, IZA Fellow Peri examined the effect of immigrants on the career of natives using data from eleven European countries in a joint study with Cristina Cattaneo and Carlo V. Fiorio. The results point in the same direction: In countries and occupations with larger immigrant competition, natives are pushed to faster occupational upgrades towards jobs, using more sophisticated skills, requiring higher education and paying higher wages. Natives are more likely to undertake entrepreneurial activities in response to larger immigrant competition. This implies that immigrants “push up” natives in the labor market, and the overall effect on wages and income of natives is small and usually positive. While some natives may still be crowded out, new job opportunities are created at the same time as foreigners take jobs complementary to those of natives. However, actual impacts depend on the local institutional settings. A study by IZA Fellow Semih Tumen (co-authored by Evren Ceritoglu, H. Burcu Gürcihan Yüncüler and Huzeyfe Torun) analyzed the effect of the recent inflow of Syrian refugees into Southeast Turkey. While wages were unaffected, the influx did in fact increase unemployment among the Turkish residents. But a closer looks reveals that the locals who lost their jobs worked in Turkey’s large informal sector. Here, the refugee inflows reduced the informal employment ratio by approximately 2.2 percent. The authors conclude that the prevalence of informal employment in Turkey has amplified the negative impact of Syrian refugee inflows on natives’ labor market outcomes. For refugees, the informal sector is the only place they can find work, as the Turkish government does not give out working permits to refugees. But for now, Brussels does not seem to focus on the potential economic opportunities of the refugee influx. At the last EU emergency summit, after confrontational negotiations and only after outvoting Hungary, Slovakia, Romania and the Czech Republic, EU leaders agreed on a one-time relocation of 160,000 people among EU member states. A sustainable reallocation mechanism based on a quota system is still far from becoming reality. Under current circumstances the share of inflows borne by EU member states is more than ever heavily skewed to a small number of receiving countries. As the ongoing public discussion shows, this unequal distribution gives rise to general resentment of immigration and negative attitudes towards asylum seekers in particular. Ever since the beginning of the refugee crisis, IZA Director Klaus F. Zimmermann has repeatedly called for a transparent quota system guaranteeing a balanced distribution of asylum-seekers across EU member countries. Countries like Sweden and Germany have accepted above-average numbers of asylum applications over the past years, while France, the UK and the central and eastern European members have been rather reluctant. The definition of a “fair share” should take into account both the population and the economic strength of each country. To handle the massive coordinative task, the European Asylum Support Office could be equipped with new competencies. In the long term, all related issues should be bundled under the responsibility of a European commissioner for refugees. IZA Fellows Jesús Fernández-Huertas Moraga and Hillel Rapoport have put forward an innovative proposal for a fair allocation of refugees. In a new IZA Discussion Paper they propose an EU-wide market for tradable refugee quotas to better coordinate national asylum policies. Their idea starts with the observation that offering asylum to refugees with valid claims is considered an international public good, but for the particular receiving country it constitutes a significant financial burden. The authors show that a market mechanism could efficiently distribute immigrants to the country with the lowest costs. This covers all the expenditures that are generated by hosting refugees: direct costs of accommodation, administrative costs and costs for social and political distress. Fernández-Huertas Moraga and Rapoport couple this system with a matching mechanism that links countries’ and migrants’ preferences, such as cultural and linguistic inclinations. The resulting solution could lead to a fair distribution of costs, which would potentially increase public acceptance and reduce the probability of social distress created by the increasing asylum-seeker flows. The refugee crisis represents one of the largest challenges for European societies, European labor markets and the unity of the EU. If Europe wants to master this humanitarian challenge without surrendering its core values, it needs to resort to smart solutions. This means a fair and effective allocation of refugees among all member states and allowing refugees access to European labor markets. Europe must transform the refugee crisis from challenge to opportunity. By doing so, Europeans would not only strengthen their own economies: Enabling refugees to build up their human capital would also give new momentum to developing disadvantaged regions of the world. Although many political refugees are unlikely to consider returning home in the medium run, remittances to their countries of origin would substantially grow with their integration into European societies.